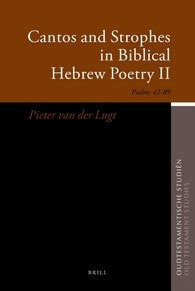 This volume deals with the poetic framework and material content of the Second and Third Books of the Psalter (Psalms 42-72 and 73-89). It is a continuation of the Psalms Project started in OTS 53 (2006). Formal and thematic devices demonstrate that the psalms are composed of a consistent pattern of cantos (stanzas) and strophes. The formal devices include quantitative balance on the level of cantos in terms of the number of verselines, verbal repetitions and transition markers. A quantitative structural approach also helps to identify the focal message of the poems. Introductions to the design of biblical poetry and the rhetorical centre of the psalms conclude this massive study. The third volume, dealing with the Fourth and Fifth Books of the Psalter (Psalms 90-106 and 107-151), is in preparation.